I will be exhibiting some of my art at the May Fair Exhibition in Richmond. If you would like to see some great art and perhaps purchase some too...come out and join me in Richmond! This exhibition was my "official" first exhibition. I believe it was a great success and I have at least have the experience of doing an exhibition now.I fouind the exhibition a great experience and was very pleased with the feedback I got from some of the other painters and visitors. I feel even more inspired now to push ahead with my painting and build up for future exhibitions. Our Easter Exhibition, which took place from 8 to 11 April at St Catherine’s School, included almost 200 hanging paintings from over 50 members along with about 100 browser works and a large number of cards. For the second year running the total value of work sold increased even though the exhibition was of shorter duration, 35 paintings and a quantity of cards being sold. We were delighted that Dr Vince Cable MP found time from his busy schedule – the general election having been announced a few days beforehand – to be our Guest of Honour at the Private View and officially open the exhibition. The prize for Best Painting - expertly judged by Mr Barrington Barber - was won by Jim Woodman for his atmospheric oil “Last Cottage at Gillen”. Highly Commended awards went to Valerie G Landon for her meticulous watercolour “Kew Museum”, Candy Maxted for her striking acrylic “The Kitchen at Strawberry Villa” and to Regina Zimmermann for her bravura oil painting “Magic Landscape”. The Favourite Painting, as voted for by visitors to the exhibition, was “Manhattan from the Staten Island Ferry”, a dazzling mixed media work by Candy Maxted. 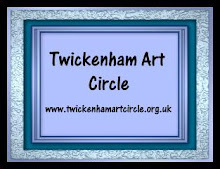 Please visit the Twickenham Art Circle website for more information and pictures of the 2010 Easter Exhibition.